This prize draw is open to residents of the UK only aged 18 years or over, except employees of Telegraph Media Group Limited and its group companies (“Promoter”), Visit Denmark and Scandic Hotels Group AB (“Prize Providers”), their families, agents or anyone else professionally associated with the draw. 3. Entries must be submitted via tgr.ph/copenhagen and entry is restricted to one per person. Once submitted, entries cannot be amended in any way. 4. Late, illegible, incomplete, defaced or corrupt entries or entries sent through agencies and third parties will not be accepted. No responsibility can be accepted for lost entries and proof of despatch will not be accepted as proof of receipt. The winner will be drawn at random from all entries received by the closing date. 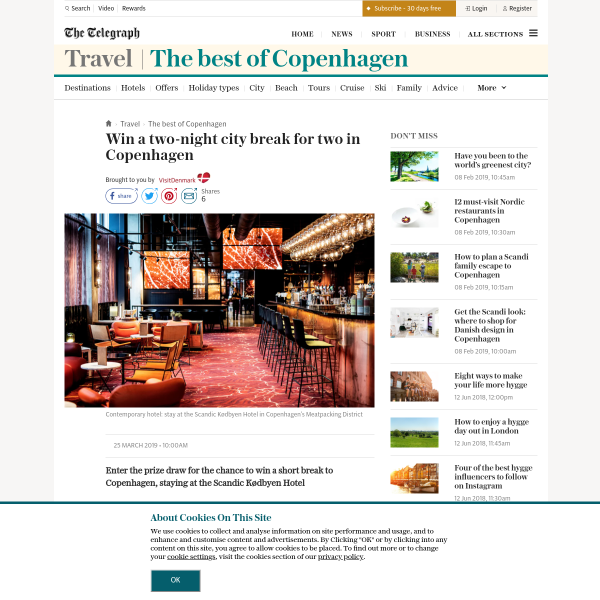 The winner’s name and county can be obtained by sending a sae to Visit Denmark - Scandic Kødbyen Hotel Winner, SPARK, Telegraph Media Group, 111 Buckingham Palace Road, London SW1W 0DT within one month after the closing date of the prize draw. 5. All entries must be received by midnight on Monday 6 May 2019. 6. The winner will be contacted by the Promoter by telephone or email within 14 days of the closing date of the prize draw. Should the Promoter be unable to contact the winner or should the winner be unable to accept the prize, the Promoter reserves the right to award the prize to an alternative winner, drawn in accordance with these terms and conditions. 7. The prize as described is available on the date of publication. Should the prize become unavailable, a substitute of equal value will be provided. Return economy class flights with SAS Airline to Copenhagen from Edinburgh, Manchester or any London airport servicing SAS Airline flights, subject to availability. Two-night four star accommodation in Scandic Kødbyen Hotel based on two people sharing a double or twin room. 9. The prize must be taken as one package. 10. The prize is valid for travel from June 1 2019 to December 31 2019 and is subject to flights and the hotels availability. 12. The prize is subject to availability, non-transferable and there are no cash alternatives. 13. The winners may be required to participate in reasonable publicity on behalf of the Prize Providers and the Promoter. 14. Entrants’ data will be used for the purpose of administration of this prize draw and in accordance with the permissions granted or withheld at the point of entry. 15. Events may occur that render the prize draw itself or the awarding of the prize impossible due to reasons beyond the control of the Promoter. Accordingly the Promoter may, at its absolute discretion, vary or amend the promotion and the entrant agrees that no liability shall attach to the Promoter as a result thereof. 16. The Promoter is responsible for the first part of the promotion, which is the publication and adjudication of the prize draw. Provision of the prize is the responsibility of the Prize Providers. 17. These Terms and Conditions are to be interpreted in accordance with English law and any dispute arising out of these Terms or their subject matter is subject to the exclusive jurisdiction of the English Courts.